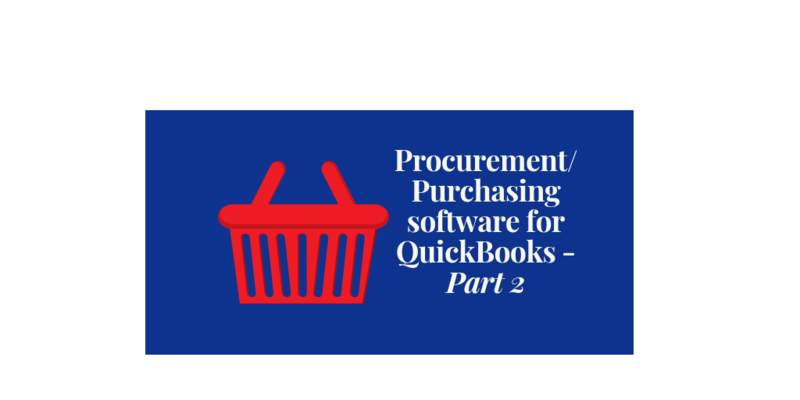 Let’s continue our look at the Tradogram procurement and purchasing software solution for QuickBooks. 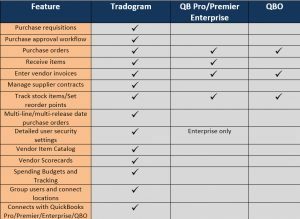 In part one, we began a comparison of purchasing and procurement features between QuickBooks Pro/Premier/Enterprise, Online and Tradogram. Detailed user security settings – within Traodgram, you can assign each user their role according to your purchasing workflow. This allows..
Users only see the enabled features on their account. They get a customized view of the dashboard and only access parts of the software that apply to them. Eliminate clutter and simplify tasks to ensure everyone gets to play their role within the process. The only version of QuickBooks offering anything comparable to this is Enterprise. And it still falls far short compared to Tradogram if detailed user permissions are important to you. Vendor item catalog – Tradogram provides the ability to import and organize your items list in an easily accessible database. Modify item information to save time, prevent data discrepancies, and reduce the risk of miscommunications with suppliers. Users can also track the purchase history of each item and set target costs for goods and services that are regularly ordered. Having the ability to link items to approved suppliers offers a significant advantage – you can quickly determine what is associated with each supplier catalog. Vendor scorecards – determine your high achievers with Tradogram’s supplier performance rating – a short scorecard that identifies those vendors that should be reused and those that should be dismissed. The performance rating provides your organization with opportunities for improving relationships with vendors. Eliminates unnecessary spending and empowers organizations to make well-informed choices. Visualize what portion of the budget has been used, and what remains. Approvers get a quick view of the budget, allowing them to make the most well-informed decisions. Companies with buyers in a variety of locations can operate with ease when taking advantage of branches and departments for multi-level management. Group your users into departments, assign managers, and allocate budgets for each. Connect all your company locations under one system. 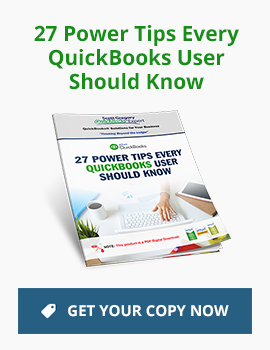 You can still keep QuickBooks! Just attach Tradogram to your QuickBooks and select data will sync between them. Note: I am a referral partner for Tradogram and receive a commission from them if you purchase using the links in this post.